Urban Environment – Preservation and improvement of features of historic interest. Concern for good standards of architecture and town planning. Representations made on all major planning applications. Our achievements include; Extending Conservation Area 69 (Sheen Common Drive) so as to include all the area from Sheen Mount School to Berwyn Road on one side, and from Longfield Drive (including Nos 1-5) to the point opposite Berwyn Road on the other side. Natural Environment – Conservation and improvement of parks, commons, green areas and trees. Any development, change of land use and inappropriate tree-felling are the subject of representations and proposals from the Society. Our achievements include; Milestone Green, Palewell Common. Traffic and Roads – Ever-increasing traffic through Mortlake and East Sheen is now a critical problem. The Society makes representations on road proposals, traffic management schemes and all transport matters, including public transport services. Our achievements include; Loading spaces on the Red Route, freed up for residents use. Aircraft Noise – This is a major nuisance and liable to worsen, unless we strongly oppose pressures to expand Heathrow and relax restrictions on night flights. The Society is affiliated to HACAN (Heathrow Association for the Control of Aircraft Noise) and makes representations on any proposals affecting the environment of Mortlake and East Sheen. Our achievements include; keeping down night flights and monitoring Terminal 5 with HACAN and FHANG. Local Amenities – The Society cares for the character of the area – the protection, improvement and development of local amenities. These range from open spaces, like playing fields and children’s playgrounds, to footpaths and pavements, benches and litter bins. The Society was active in the creation of the thriving Sheen Lane Centre and the Shene Sports Centre. Our achievements include; Sheen Lane Centre, Shene Sports Centre. 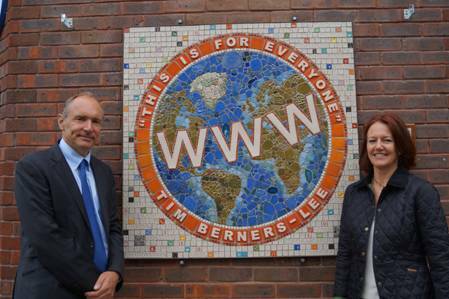 Picture of Sir Tim Berners-Lee (a former pupil of Sheen Mount School) with Sue Edkins, who created this wonderful mosaic depicting the world wide web, at the opening ceremony outside the Sheen Lane Library on 24th June 2013. Social – Fund-raising activities are organised for local causes. Social gatherings, lectures, walks and visits to places of interest provide opportunities for members to meet each other. Our achievements include: raising funds for the local charity FiSH .